We hit it big in Nachitoches LA in March. The city was ablaze with azaleas, tulips, and wisteria. 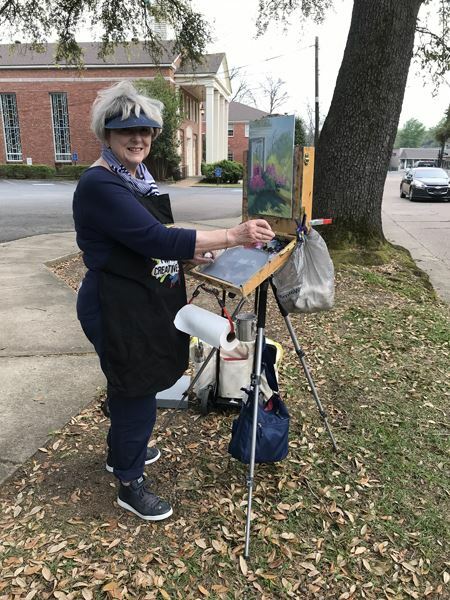 Weather cooperated and we were able to get some interesting paintings of locations around town, at Melrose Plantation (awesome), and at a private home on Lake Sibley (also awesome). The town folks were very hospitable and we had a great group of artists (17 + guests). 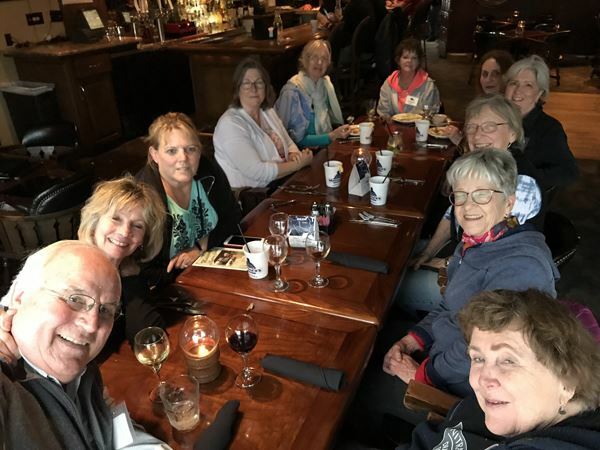 Thanks, again, to Linda Snider-Ward for arranging our meet with her friend, Lou, on Lake Sibley. Also, thanks to Bonnie Dunn for her help in scouting this location. This is a location we will definitely revisit in the future. Michael Holter was elected as a member of the Salmagundi Club in New York City. He will participate in the following shows this spring: The Fabriano Aquarel in Fabriano, Italy; The California Watercolor Association Show; The Western Federation of Watercolor Societies; The Georgia Watercolor Society; The Watercolor Art Society, Houston; The National Watercolor Society Member Show; The Southern Watercolor Society. 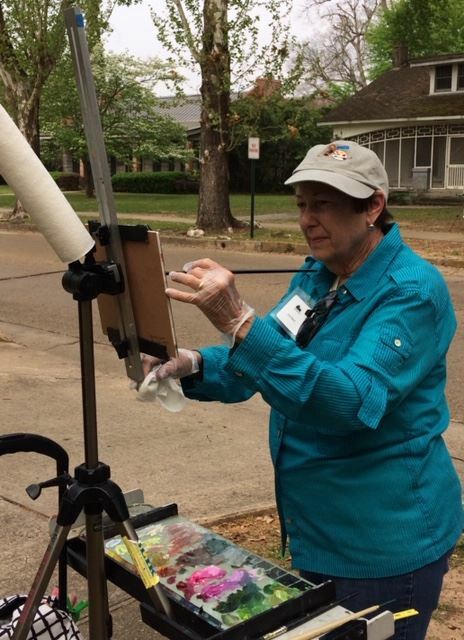 John Pototschnik, OPS Emeritus Member, will share the story of his artistic journey on Monday, April 22, 7-9 PM at the Plano Art Association, 902 E. 16th Street, Plano TX. His illustrated talk, From There to Here, presents a visual account of that journey. John will also speak at the 8th Annual Plein Air Convention in San Francisco on April 26, 9:00 PM at the Hilton San Francisco Union Square Hotel. The Unlimiting Limited Palette will be the featured topic. Linda Snider-Ward was accepted in the American Women Artists On Line Exhibition. The work will on on the site for one year. Rusty Jones recently lost his father. OPS members extend heartfelt sympathy to Rusty and his family. 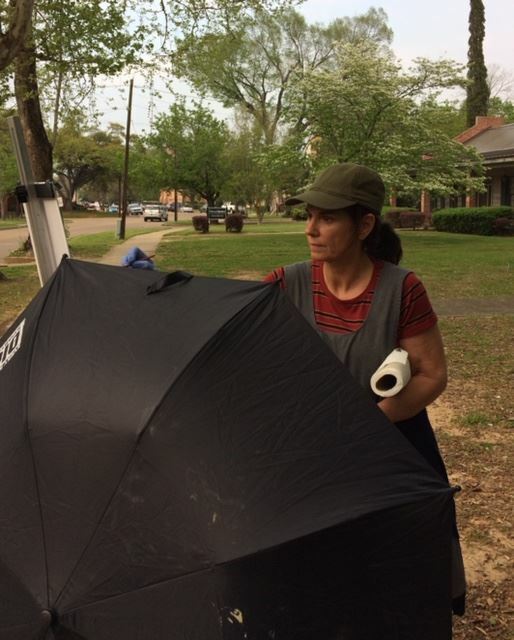 OPS Members participate in many juried competitions and events throughout the year. Listed below are award winners from just some of those events. 2019 American Impressioist Society Small Works Showcase, Crooked Tree Arts Center, Petoskey MI, June 1-August 31. The next paint out is in Central Texas (April 18-20). We start in LaGrange where the Art Connections Gallery is hosting an evening reception for us. 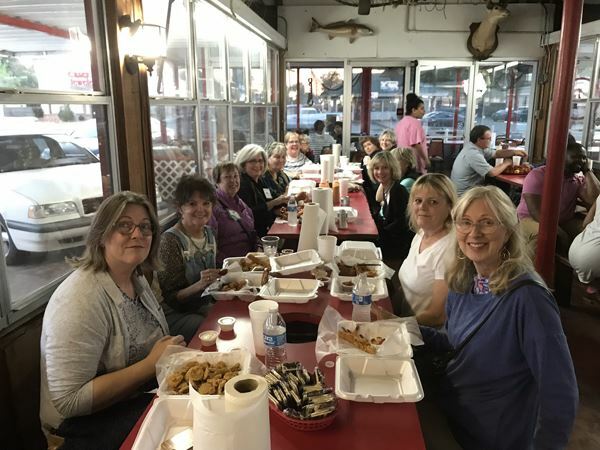 The next day we work our way to Smithville and end up on Saturday in Bastrop. 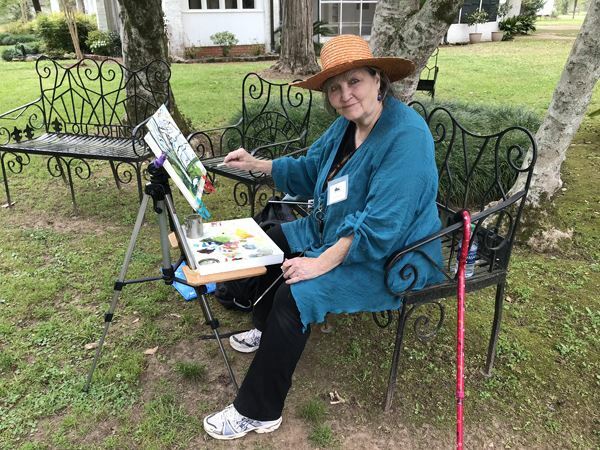 Registered members may participate in the wet painting reception and show on Saturday evening at the Lost Pines Art Center in Bastrop. This event is open to the public and will be publicized in the area newspaper. Be sure to get in on the fun. Registration is open for this event. 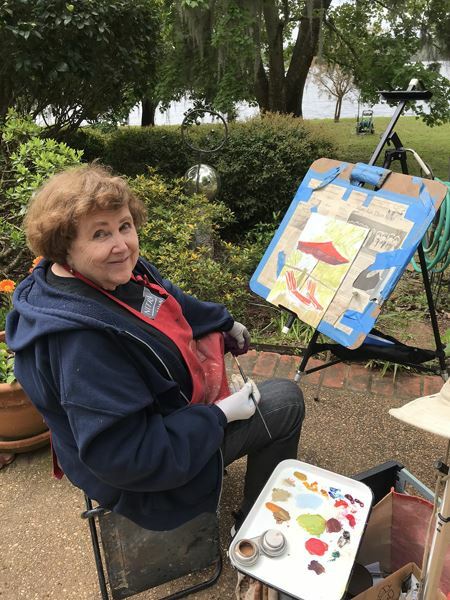 May brings us Plein Air Southwest 2019 then we take a break during the hot summer months. Paint outs start again in September with the Plano Balloon Fest (officially, the Intouch Credit Union Plano Balloon Festival), September 20-22; then we quickly repack and head to paint at Estes Park and Rocky Mountain National Park, September 23-28. In October, we try again for a beautiful weekend in San Antonio. The Felder Gallery will host a Wet Painting Show and there will be a few surprises. This paint out is scheduled for October 17-19. In mid-November we head for the hill country and Wenmohs Ranch (November 14-16). Dena has graciously offered access to her ranch where many good paintings have come to life. Details on these locations are forthcoming. We all strive to be better painters. Practice, education, sharing of ideas, and technique is our path. Check out the educational selection of videos on the Outdoor Painters Society website in the Members Only section to taste a change of media, or to review the basics. Coming Soon to our OPS Library is a new 5-hour comprehensive video on composition. 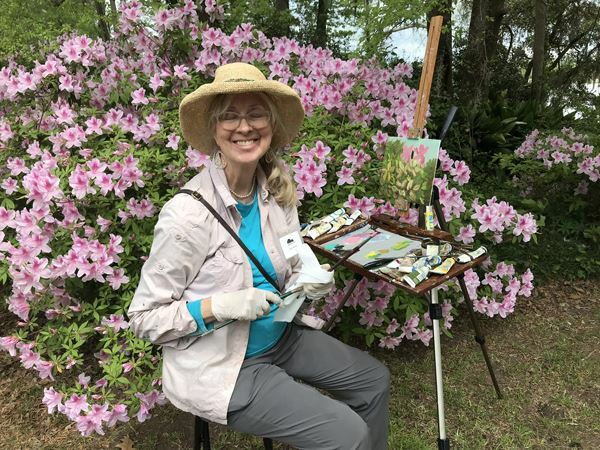 Bruce Peil is one of the founders of the Outdoor Painters Society and offers a three-day workshop at his studio each month. Students also have the option to stay at the Artist Retreat which he and his wife operate and is just a short walk from the studio. 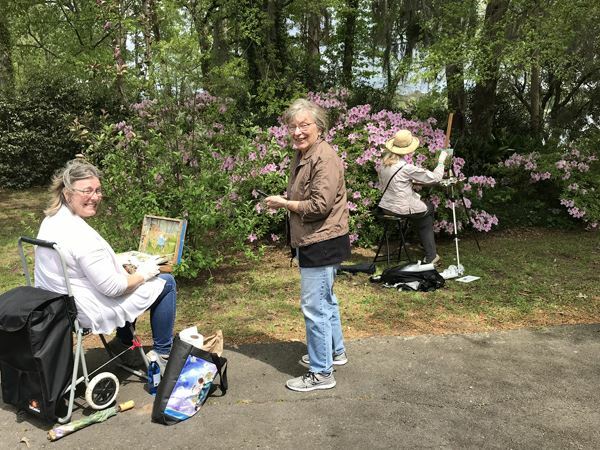 These workshops are a combination of Studio and Plein Air, weather permitting, and covers all aspects of painting whether on location or in the studio. 55 acres of large trees, open pastures left natural, and big skies are the subject matter you see in many of his paintings, and are there for you to paint. Cost: $395 for the three days. Lodging if needed, is separate. These workshops include meals. Creativity is not just for artists. It's for business people looking for a new way to close a sale; it's for engineers trying to solve a problem; it's for parents who want their children to see the world in more than one way. Artistry is important. Skill, hard work, rewriting, editing, and careful, careful craft: All of these are necessary. These are what separate the beginners from experienced artists. There are people who help you in life. I've been given a helping hand, and that's why I feel it's my duty to help younger artists. Plein Air Southwest Salon 2019, is excited that the awards juror, DAVE SANTILLANES of Ft. Collins CO will conduct an OPS sponsored workshop May 14, 15, 16 in Grapevine TX! 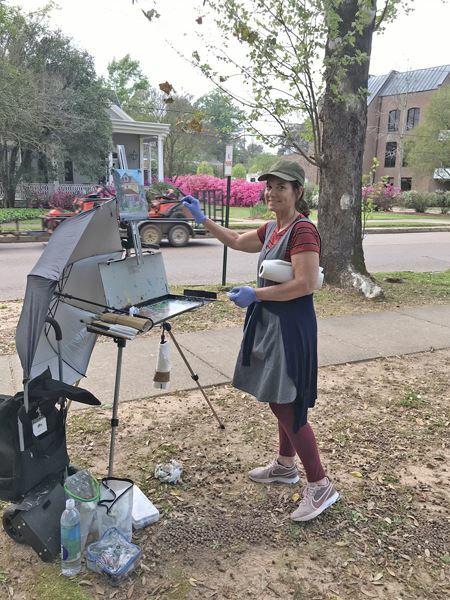 The format is a three-day Plein Air to Studio which will include indoor classroom study as well as outdoor on-location in downtown historic Grapevine, near the train station and grain silos. Grapevine is a suburb northwest of Dallas and an easy 10 minutes from DFW airport. Open to intermediate and advanced artists, this workshop is limited to 15 participants and will fill up fast. The total fee is $450.00. A deposit of $225 is required at time of registration to hold your space. An invoice for balance of $225 will be emailed on or about April 25. Refunds: a $50 cancellation fee, if cancelled before April 15. No refunds after April 15. Thanks to Irma Ward for the photos from the Nachitoches LA paint out.